Thursday, Oct. 6, 7 p.m. It's been a hell of a year for Provo-based musician Gabi Manning, aka GABI. After she spent last winter writing an album's worth of songs, the West Coast rep for Chill Mega Chill Records serendipitously reached out to her on Twitter. "He was looking for more female leads for their label. When he came across my music, he shot me an email asking if I was working on anything," Manning recalls. "I sent him some demos and he said they'd love to have me." After listening to her music, you can understand why GABI is right at home with Chill Mega Chill. Her new album Sea Glass is a collection of lo-fi tunes that have an uncanny ability to clear the cobwebs from an over-cluttered brain, imparting a feeling that can only be described as chill. Minus the drums on a few songs, she plays all the instruments herself. And she's no slouch in the realm of post-production, recording, mixing and mastering the album in her apartment. Initially she was "stressed out" by such a daunting task, not to mention doing her songs justice; "When you're live, it's easy to look at someone and connect with them, but making a song powerful through recording can sometimes be hard," she says. Ultimately, the project "felt very natural" as it progressed. Sea Glass is a bit of a musical anomaly, and therein lies the power that Manning is talking about. It combines melancholy vocals that strike a chord somewhere between Cat Power's haunting wail and Jessica Lea Mayfield's disarming croon, with unexpectedly upbeat lyrics that compare love to the smell of pancakes. When it all coalesces with the leisurely way that she strums her guitar, Sea Glass makes for a decidedly serene listening experience. As Chill Mega Chill prides itself on its throwback penchant for producing albums on vinyl and cassette, GABI's signature sound is only enhanced after popping it into a tape deck and letting it unfold like a storybook. "Getting signed was a huge confidence boost," Manning says. "When I got on the label, and found a group of people who wanted to invest in my creative ideas, I realized that it's not just people being nice." While her music career has definitely started on the right foot, Manning's foray into the music world almost didn't happen. Her original plan was to become a professional skateboarder, but those plans wiped out when Manning was injured twice in a row. "I got really depressed because I couldn't skate and was having a hard time walking as well," she says. "Everything just sucked right then." During her recuperation, Manning discovered a latent affection for playing the guitar. "By the time I had recovered, I had really developed a love for music." Signing with Chill Mega Chill provided Manning the impetus to take her show on the road. She kicked off her first tour in late spring while juggling a full schedule at Utah Valley University. "I was taking 18 credits and trying to book my first tour, which was crazy," she says. "By the time we got on the road, it was great. I couldn't have asked for a better first tour." Her travels took her all over the Western U.S., playing gigs in her hometown of Phoenix, along with shows in San Francisco and Los Angeles before returning home to dig into a few shows in our neck of the woods. 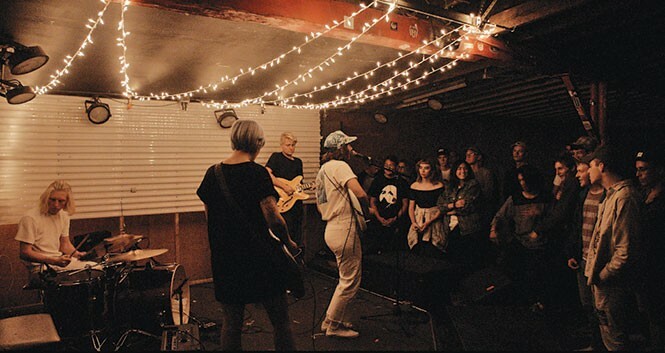 One of these shows is the release part for the second edition of SLC Pink, a zine dedicated to local female, trans and non-binary artists, co-founded by Elaine Sayer and Chloe Monson. GABI is only one of several musicians, spoken-word artists and comedians performing at the event. "I became friends with Elaine through seeing her at Kilby Court," Manning says. "She and Chloe are hard-working, honest women, and they have the funniest ideas."